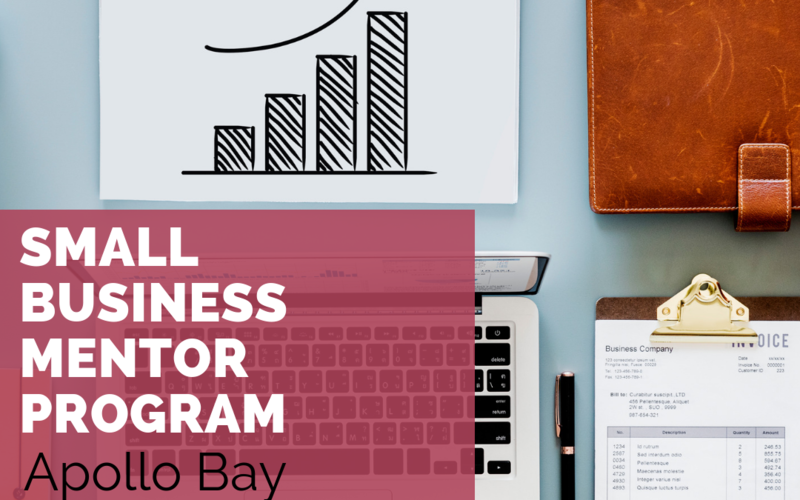 The Mentoring Program is available for small business owners or anyone with a small business idea in the Apollo Bay area, it is an excellent opportunity for development. Successful applicants will be paired with carefully selected mentors to complete this 8 month program of professional growth. Mentoring services are provided voluntarily by highly experienced business people with skills and qualifications in a wide range of industries and disciplines. Two Networking events will be held during the year providing the opportunity to meet with regional government and funding bodies. The program is 8 months long. Starting with launch event at mid-April and ending with closing event mid-December 2019. The program will open for application from 1st February 2019, with a closing date of 22nd March 2019. Launch event: all mentors, mentees and interested parties are invited. This is an opportunity for the mentors and mentees to meet. The launch event will have a Q&A session with a local industry leader. End of Year Event: all participants and potential participants for the 2020 Program will attend. This event will involve speakers from Regional Development Victoria. All mentees need to make a formal application to participate in the program. This is an important step which requires the mentee to think about their goals as a participant and clearly articulate them in their application. Participating in the program requires significant commitment from Mentees, in terms of time management, professionalism and reliability. If their current circumstances make this commitment difficult to give for whatever reason, it is best not to apply until such times as they can actively participate as they are unlikely to be able to benefit fully from the opportunity and may prevent someone else who can commit from taking a place in what is a highly competitive program. There are 10 spaces available in the 2019 small business mentoring program. After the closing date, 22nd March 2019, all Mentee applications are assessed by an independent committee which includes Marrar Woorn Committee and mentoring program manager. Those applications which meet the assessment criteria are then interviewed by the Mentoring Program Manager. If the candidate is successful, they are then referred to prospective mentors. The Mentor will make a decision on whether or not they take on a particular Mentee and this is not within the control of the assessment team. As the application will be given to the prospective Mentor, it is in the mentees interests to take care to make the application as strong as possible in order to increase the likelihood of being accepted by a quality Mentor. All unsuccessful applicants will be informed as soon as possible. Full feedback will be given to unsuccessful candidates. As we only have 10 spaces available in 2019, the best applications and Mentor skills available will be taken into consideration whilst choosing mentees. All mentees are interviewed with a set of questions to ensure their commitment to the program. They will also be asked to complete a Myer Briggs test and values elicitation to ensure we match them with the best mentor possible. All mentors will be interviewed in detail before they are appointed a mentee. Mentors will be handpicked, ensuring they have the relevant skills and experience to mentor a mentee. Mentors will be required to complete a police check before they can take part in the program. Mentoring is a developmental partnership through which one person shares knowledge, skills, information and perspective to foster the personal and professional growth of someone else. Mentoring is a concept that has taken off in recent years. As one-to-one developmental assistance has become more popular, the term mentoring and coaching have come to be used as catch-all descriptors for which there are no universally agreed definitions. To create opportunities for growth and employment in Apollo Bay Region. To provide an opportunity for Mentors to transfer their wisdom and experience to Mentees, empowering them to become future business leaders. To give Mentees the opportunity to be supported in transition to a new location, sector or career level. To give Mentees access to knowledge from other professions and disciplines. To support the continuous growth and development of Mentees in their professional careers. The Mentoring Program, supported by Learn Local, runs over an 8 month period. During the period where applications are open, no selections or pairings will be made, candidates will be contacted after the closing date with an update on their potential mentor. Program administration fees for 2019 will be $150 + GST, a fraction of what you would pay for similar programs in the commercial market (Please note that this is not a fee for service from your Mentor). This is made possible primarily through the Mentors donating their time and expertise. When you meet your Mentor, be sure to thank them for their generosity! Mentees are responsible for maintaining ongoing contact with their Mentor, with organisation of these meetings being the responsibility of the Mentee – this is really important and will be pivotal to your success. The format of the relationship will be determined by the pair and may include e-mail, Skype, phone or face-to-face meetings. Be a current resident of Apollo Bay area. Think about your goals for being involved in the Program and be ready to articulate your “grand plan” to your prospective Mentor if an introduction is made. The more clearly you can present where you want to get to and why, the better placed they will be to help you go in that direction. Don’t book a six month trek in the Himalayas – you will need to ensure you make the time to actively participate in all aspects of the program, including your peer-based project. Get ready for 2019 being a year when something great happens for your personal and professional development – and most of all, enjoy the experience! You will only use personal information supplied to you about your Mentor/Mentee (either by the Neighborhood house or your Mentor/Mentee) in a manner expressly authorised by your Mentor/Mentee. As a Mentee, you must attend all mentoring events in your program year. All participants, including both mentors and mentees need to submit a full evaluation form on completion of the mentoring program. Survey Monkey will be used to collate the mentoring evaluation documentation. All evaluation documents will be compiled into a full report to be submitted to relevant funding bodies and/or organisations.